In some climates, owning an outdoor propane tabletop or freestanding heater allows you to eat outside the entire year round. For those of us who spend every moment possible outdoors, having an outdoor propane patio heater is a true blessing. An outdoor patio heater means that you can start spending time outdoors earlier in the spring, and very late into the fall, entertaining your guests on your patio or deck. In some climates, owning an outdoor propane tabletop or freestanding heater allows you to eat outside the entire year round. There is an array of excellent patio heaters to choose from that emit a great deal of heat, certainly enough for a picnic table full of delicious food for your family and friends. The biggest choice when looking at propane patio heaters is to decide on the size of the heater, and whether you would like to have it stand on its own, or sit on top of a table. Personally I like the freestanding heaters the best. I think that they spread more heat, look better on your deck, and give you the most room to work with for a party or event. The free standing propane patio heaters are also safer if you have young children, as the child cannot reach the heating elements on the top of the heater, and they are much harder to knock down. The height of a free standing patio heater also means that the heat will spread farther, and cover a larger area than a table top version. Stylistically, the different models look very similar, because of the need for the design to focus on the spreading of heat more than how the heater looks. The plate like top focuses the heat down and outward away from the heater, while the lamp core generated the heat and blows it outward. 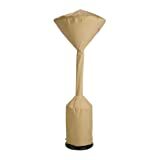 Garden Sun has several models of both floor standing propane patio heaters and table top propane powered patio heaters. These come in both stainless steel and green. One of the best features of the Garden Sun heaters is the push button ignition, which makes turning the heaters on no muss no fuss, and easy for anyone. Push button ignition is also the safest way to ignite the propane heaters, one that even a ten year old child can do with adult supervision. You don't have to worry about lighters, or matches, just push one button to get your patio heater started. It is also easy to replace parts with Garden Sun. Just contact the manufacturer for the parts you need, and they can tell you where the best place is to buy them. If you are looking for a more antiqued look to your patio heater, you may want to consider the beautiful patio heaters by Fire Sense. These heaters are a step above in looks, available in copper plate, gunmetal, and stainless steel with a black powder coating. These really have an evening entertainment look to them, and are perfect for a wooden deck or wrought iron patio area, as well as for restaurants that want to have an outdoor seating area in the cooler weather. Fire Sense also carries a more standard version and a deluxe model. 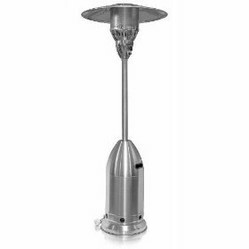 I have to admit that I have fallen in love with the gunmetal deluxe floor standing patio heater. Do you want to have a table top or floor standing heater? This is the most important question because it narrows down your search by half of the heaters available. Is the price your main issue or do you have a style in mind? If you are looking for a style to go with your home decor or your patio or deck, then style is how you should search, then narrow it down by price. If price is your main search criteria, then look for the sales and bargains on the type of heater you want. Do you want a heater that can be easily transported from place to place or will it stay in one place most of the time? How much power or heat do you want to heater to put out? How much of an area will the heater cover, and how large an area do you need to heat. Your space requirements are very important, as you do not want to over use the heaters. You are better off buying two heaters, than trying to stretch one too far. If you do, you will either burn it out, or cause some other dangerous situation. What kind of safety issues do you have? Do you have small children? Does your residence have rules about outdoor heaters? Safety is an important concern. Once you have the answers to all of these questions, then you are ready to shop for an outdoor propane heater! You can buy your heater, then finally get to the good stuff, partying with family and friends. Love these things. Let's you get another season on the patio. Shading and temperature control tips for your outdoor room, patio or barbecue area.